14.60 руб. 5000 шт. 3-4 недели 2500 шт. 2500 шт. от 5000 шт. — 14.50 руб. 68 руб. 724 шт. 3-4 недели 1 шт. 2 шт. от 10 шт. — 55.80 руб. 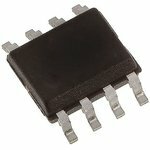 The FDS6930B is a dual N-channel Logic Level MOSFET produced using Fairchild Semiconductor's advanced Power Trench® process that has been especially tailored to minimize the on-state resistance and yet maintain superior switching performance. This device is well suited for low voltage and battery powered applications where low in-line power loss and fast switching are required.